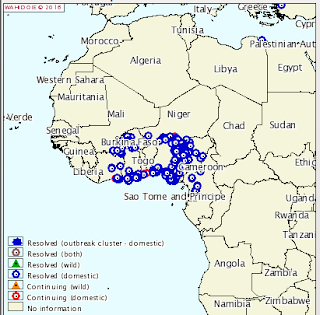 In December 2014, after an absence of roughly 7 years, H5N1 returned to West Central Africa (see EID Journal: H5N1 In Nigerian Poultry – 2015). A bit unexpectedly, it was China's recently emerged clade 2.3.2.1c, and not a return of the the clade 2.2 virus that had previously circulated there. 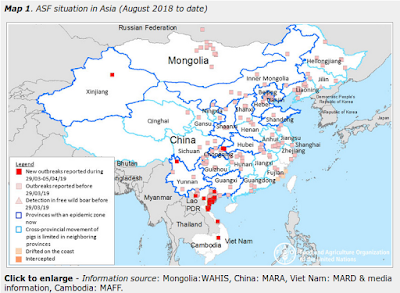 Since then H5N1 has become so well entrenched in Western Africa (Cameroon, Burkina Faso, Cote d'Ivoire, Ghana, Niger and Nigeria) that last month we saw the latest in a series of concerned FAO Calls For Increased Vigilance On H5N1 In Africa. 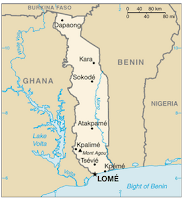 Surrounded on all sides by countries with outbreaks , Togo today reports two outbreaks in their Maritime region. 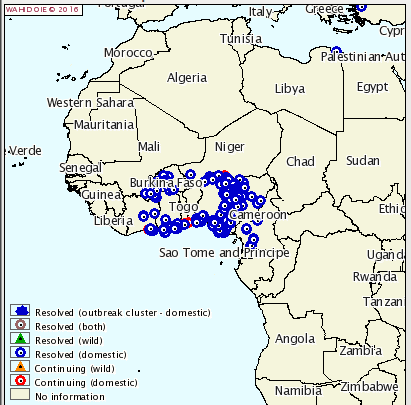 The OIE Alert lists their last outbreak as occurring in January of 2009. 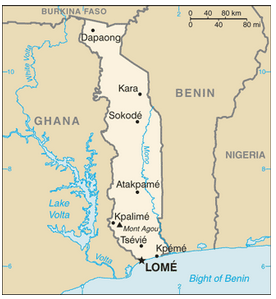 While no human infections have been reported in West Africa since 2007, there are doubts whether the limited medical and surveillance resources in the region would pick up sporadic cases. Last summer, in FAO: Concerns Rising Over Spread Of Avian Flu In Africa and again last October in WHO Scales Up Influenza Surveillance In Africa we looked at some of these challenges. A map of the migratory bird flyways (see above) shows that West Africa sits at the southern intersection of no fewer than three migratory flyways. 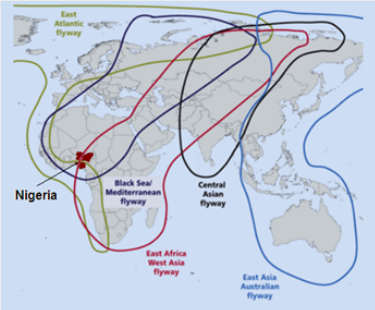 Routes that begin in the northern climes of Russia, Mongolia, and China where H5N1 is known to circulate in wild birds – and that cross both Europe and the Middle East. A major concern is that the disease may become endemic in the entire region, particularly in Nigeria where avian influenza has become so entrenched in poultry production and marketing systems that it will be difficult to eliminate. 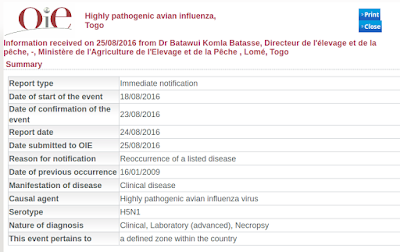 While it is not a huge surprise that Togo is now reporting H5N1, it is further evidence that HPAI avian flu is becoming more entrenched in the region.